American artist Alexander Calder redefined sculpture by introducing the element of movement, first though performances of his mechanical Calder’s Circus and later with motorized works, and, finally, with hanging works called “mobiles.” In addition to his abstract mobiles, Calder also created static sculptures, called “stabiles,” as well as paintings, prints, jewelry, theater sets, and costumes. Alexander Calder is widely considered to be one of the most important American sculptors of the 20th century. He is best known for his colorful, whimsical abstract public sculptures and his innovative mobiles, kinetic sculptures powered by motors or air currents, which embraced a chance in their aesthetic. 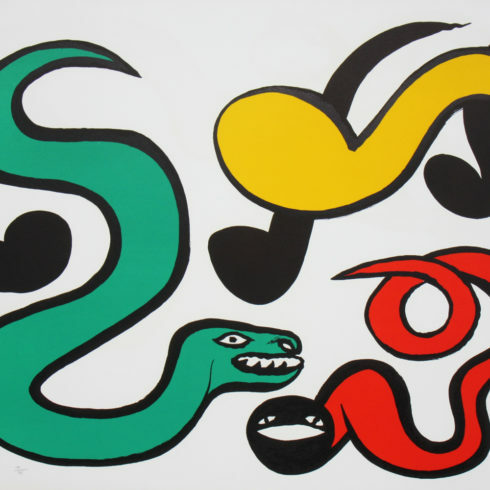 Our Fine Art Gallery has the finest quality Alexander Calder lithographs, original prints and editions. We have a large inventory available off-site and we encourage you to make an appointment to see specific works you are looking to collect. We are happy to meet you at either our art gallery showroom or at your home or office for a private presentation. Alexander Calder was born in Lawnton, Pennsylvania on July 22, 1898, to artist parents: his father was a sculptor and his mother a painter. From the age of 8 on his parents provided him with a workshop in which to create. For Christmas 1909, at the age of 11, Alexander Calder presented his parents with two of his first sculptures, a tiny dog and duck cut from a brass sheet. The duck was kinetic—it rocked back and forth when tapped. 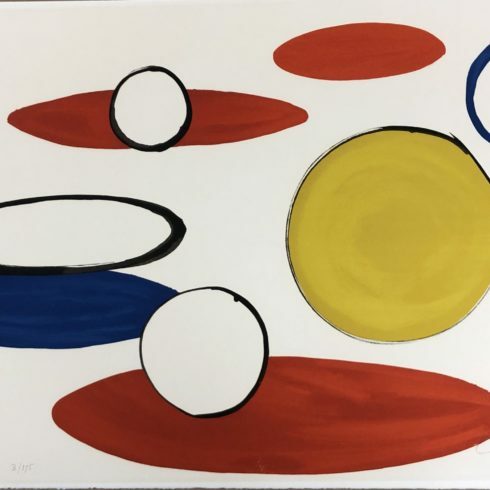 While working as a fireman on a ship bound from New York to San Francisco, Alexander Calder awoke on deck to see both a brilliant sunrise and a sparkling full moon; each was visible on opposite horizons. 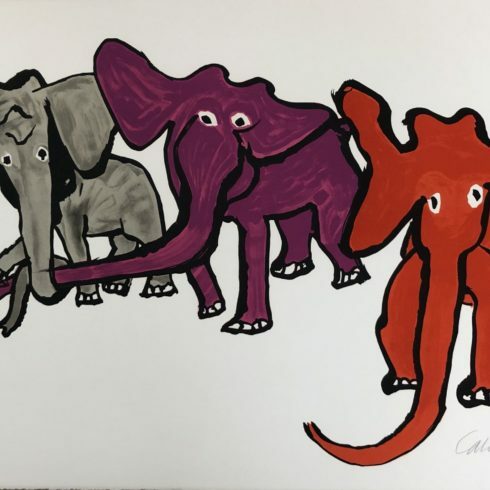 The experience made a lasting impression on Calder: he would refer to it throughout his life. Never interested in becoming an artist, Alexander Calder graduated from Stevens Institute of Technology in Hoboken, NJ with a practical degree in mechanical engineering in 1919. In 1923 he moved to New York and enrolled at the Art Students League where he and his fellow students made a game of rapidly sketching people on the streets & subways. Alexander Calder became known for his ability to convey a sense of movement with a single unbroken line. He took a job illustrating and was sent to sketch the Barnum & Bailey Circus–the circus would become a lifelong interest for the artist. 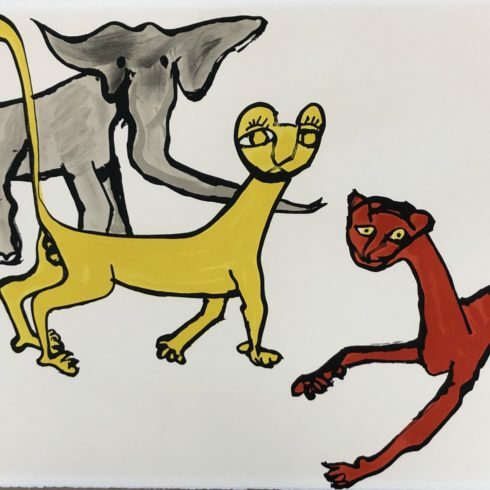 Alexander Calder moved to Paris in 1926 and befriended prominent artists and intellectuals such as Joan Miro, Fernand Leger, Marcel Duchamp and Piet Mondrian. In 1931 Calder created his first truly kinetic sculpture and gave form to an entirely new type of art. That year he married Louisa James, a niece of writer Henry James. Their first daughter, Sandra, was born in 1935 and a second daughter, Mary, followed in 1939. In 1943 The Museum of Modern Art in New York gave a comprehensive exhibition of Calder’s work—the show’s exhibition catalog was the first extensive study on the artist. 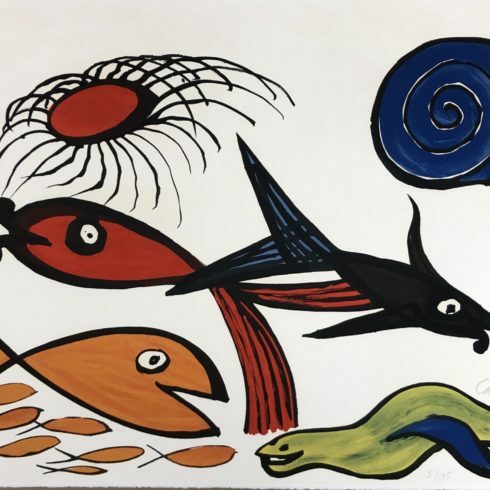 By the mid-1940s Alexander Calder was given exhibitions in Berne, Rio de Janeiro, Boston, Virginia and New York sealing his international status as an artist. Calder won the first place prize for sculpture at the Venice Biennale in 1952. Numerous international public commissions followed including Braniff Airlines who asked the artist to paint a few of their jet planes as ‘flying canvases’ in the 1970s. Calder, who described his mobiles as ‘four-dimensional drawings’ died in 1976 shortly after his retrospective at the Whitney Museum of American Art in New York City.